Take Exit 11 - Duxbury / Route 14. Take a right at the end of the exit ramp to go east on Route 14, toward the ocean. Within 1/4 mile, you will come to a small rotary. Take the second exit from the rotary to remain going straight on Route 14. After about 3/4 mile, bear right at the fork to stay on Route14. Follow to traffic light, junction with Route 3A, (approximately 1 mile). Go straight through light for about 1/2 mile. Take a right onto Alden St. (just before the Percy Walker Pool on the right). The library is just ahead on the left. Take a left in front of the library, go past the library, and straight down the hill towards the fields and parking. Park in the first spot available, Lower Alden is the field to your right, closest to the library and playground. 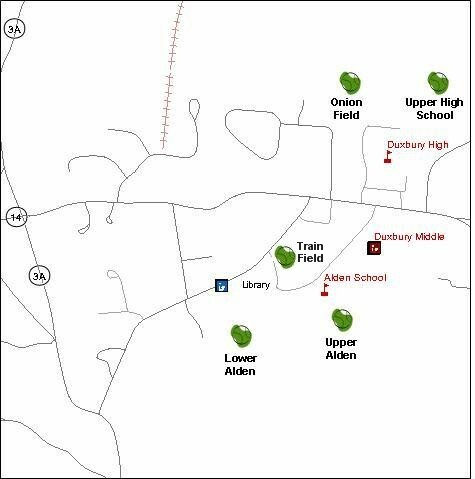 Onion Field is behind Duxbury High School, to the left of the football field. Look for Duxbury High School on the left (just after the Percy Walker Pool on the right). Drive to the rear of the school. Onion Field is all the way back on the left side. Directions: Directly in front of the Duxbury Free Library, down the grassy hill, adjacent to Alden Street and close to the Percy Walker Pool. Follow the rows of parking spots just around to bend, Upper Alden is the field just ahead, closest to the school. Upper H.S. Field is behind Duxbury High School, to the right of the football field. Drive to the rear of the school. Upper H.S. Field is all the way back on the right side.